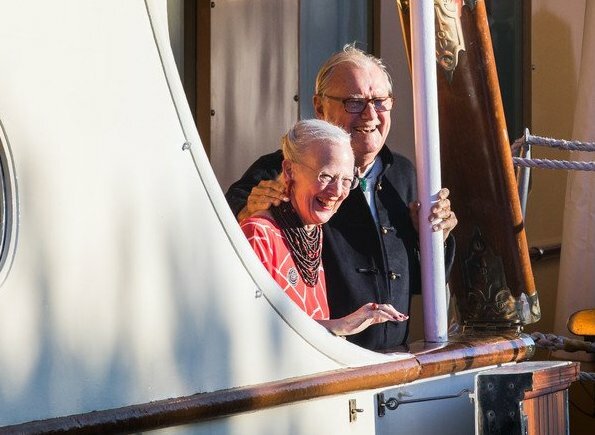 Queen Margrethe of Denmark held a birthday dinner for her grandson this evening on the royal yacht Dannebrog. 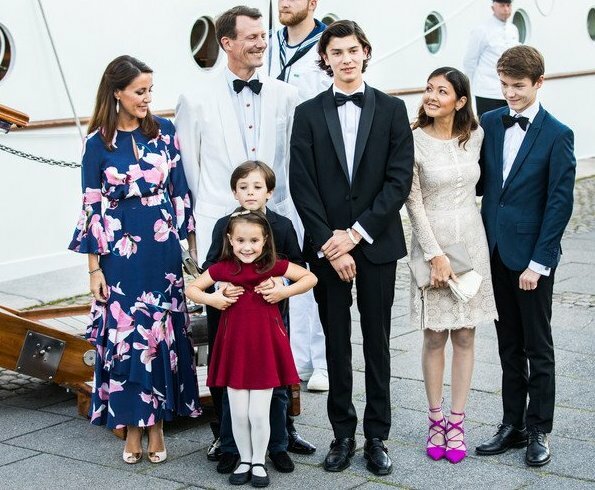 Prince Nikolai's 18th birthday was celebrated by a family dinner on the Dannebrog which is docked at Amalie Harbour on August 28th, 2017. 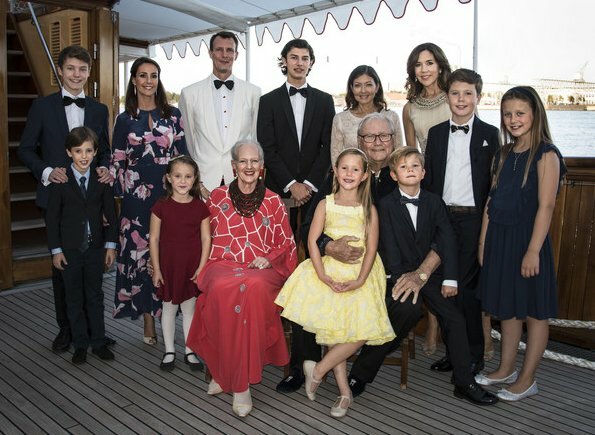 The Danish Royal Family attended 18th birthday party of Prince Nikolai. Marie is trying really hard, but she will never be as elegant as Mary. Because Mary is natural. Marie looks awkward in this. But the fabric is nice, and her hair too. Mary has a stylist, not so 'natural' ! Look at her style before she became Crown Princess! I find Alexandra, 53 years old, is dressed as she trying to look younger, her dress is too short! Maybe I was wrong. You know them better than I do. I like Marie's dress the best, but I think it would be nicer if shorter. An attractive family. A wonderful celebration. Congratulations Nikolai! I agree about Mary being stiff. Letizia is even worse. But Marie just doesn't seem well dressed to me. Totally different opinion, MARY has that intuitive style, not Marie..
You were not rude, not mire than me calling Mary stiff! It does look often like Mary is trying hard. I associate that with the pressure of constantly under the flash lights, and to some extent to her Australian/ British background, i e the inclination towards more formal attire and less 'flair'. It's obviously a matter of one's preferences and taste if Mary 'a style, classy but rather boring at times, is better or worse than Marie's French flair. I actually like them both and enjoy the fact that they are quite different. None of the ladies look really good here in my opinion. The kids are the stars, they all look great. Mais ou est Frederik ? And where is Frederik ? Frederik is in South Korea for the IOC meeting for winter olympics. Nice family photos. I like all the ladies' outfits although I remain to be convinced by Alexandra's shoes with her dress. Mary's dress is nice but I think on balance I prefer Marie's. The grandsons with their bowties are wonderful and the little girls look cute. Shame Frederik couldn't be there. 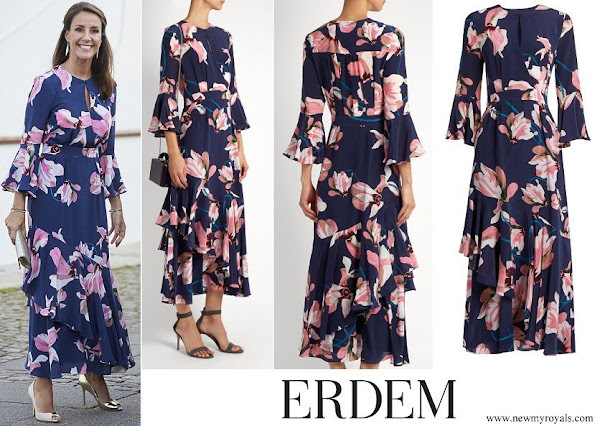 This is a repeat dress from Princess Mary but I don't mind. She looks radiant. Little Josie's dress is very nice. I like the dress on Alexandra but the shoes are hideous. I'm glad to see that dress again - its too beautiful to retire it! Again Mary's the best dressed. Alexandra's dress doesn't suit her. Nikolai has grown so tall, her mother looks so small next to him. I liked Mary's dress the best. Marie's dress seemed to swallow her (i would have preffered updo and different shoes with this dress). I like Marie's dress I think she looks beautiful. Maybe her choice of outfit seems too much for many of you because she often wears simplier dresses but in my opinion this one suits her well. I wish she wore similar colourful dresses more often! Mary is beautiful as always. All the kids are super cute! Unfortunately I don't like Alexandra's dress and the shoes are terrible in my opinion. 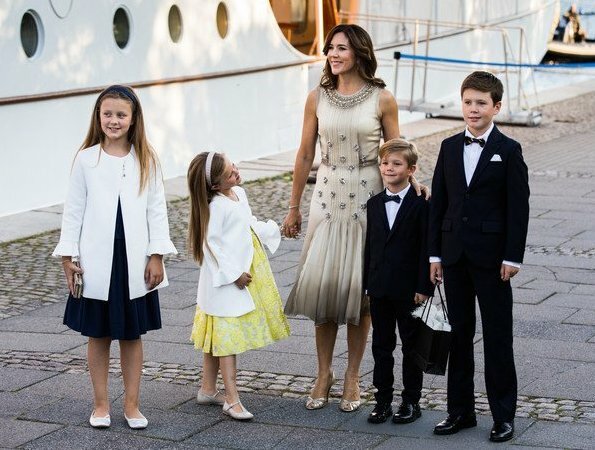 From my point of view the most elegant dress is Princess Mary. Alexandra´s dress is beautiful too, but I don´t think it fit well on her much less her shoes are hideous. Marie´s dress is also beautiful. Marie is beutiful and look youngish, the dress and hair. Agree, the shoes are not right. Marie and Alexandra should've swapped shoes! Yes, that is a good idea! Wow, Nikolai has grown up quickly. Mary looks beautiful, and while I agree her style has evolved since her marriage, I do believe Mary has a good sense of style, is always beautifully groomed and she seems to know what suits her (most of the time). Her style appears, although it probably isn't effortless. Marie, would have had the same opportunities and advise as Mary, yet something always looks "not quite right" with Marie. To me Marie always looks as though she is trying hard, but she never quite gets it right. In this instance I believe it is either the length of the dress or the shoes, as the dress looks nicer on the model in my opinion. Those few inches and the toning shoes seem to make a huge difference. I think all the children look wonderful in their formal attire.